As an HR leader, do you find yourself spending a large portion of your time on repeatable, mundane tasks? Have you ever wondered why you are stuck in a veritable loop, even after significant advancement in technology? 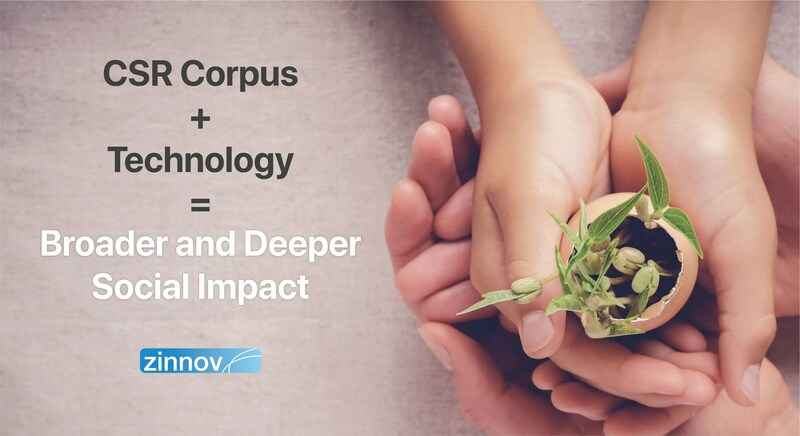 Over the last decade, we at Zinnov, have worked with HR leaders from across the globe, and a decade ago, and even now, a common thread seems to unravel – the serious inefficiencies in the way HR organizations operate – be it scheduling an interview with a potential candidate, performing their initial screening, or gathering their feedback post the selection process. The ubiquitous reality is that most of these tasks which are time thieves, can easily be automated, freeing up valuable bandwidth for the HR leaders to focus on strategic issues. Imagine a scenario where a junior recruiter – yes, we mean a millennial – stuck in a productivity rut. Her workload is overwhelming as she is spending most of her bandwidth on initial screening calls of candidates, repeating her responses for almost each one of them, reaching a point where her responses are almost robotic. The writing is on the wall, isn’t it? Today, the possibility of having the initial screening responses done via simple robotic scripts, especially in cases where there are mostly standardized questions and answers, can be a reality quite easily. One could argue that her frustration is justified. To put things into context, she probably believes that these monotonous, repetitive tasks, can be easily done away with, using advanced technology, like the ones she uses in her other mobile applications such as Google Assistant, Amazon Echo, Cortana, Siri, etc. On the one hand, the majority of HR firms and functions are still operational in native time-consuming methods. While on other, she is seeing the influence, impact, and reach of new age technologies such as Machine Learning, NLP, Deep Learning, in her daily routine, that don’t touch her profession. Today, we see an increasing number of applications of AI-based solutions across verticals like predictive diagnosis, personalized recommendations, targeted marketing, precision farming, and what not! But somehow, the full potential of AI is still a distant reality in HR, as companies continue to think of it as a ‘good to have’ but not a ‘must have.’ This seems to be a narrative similar to every support function across organizations. However, if we take a closer look at some of the activities of an HR, then we will find a contrasting story. This function is burdened with redundant, voluminous tasks such as sourcing candidates, screening resumes, scheduling interviews, gathering feedback, etc. 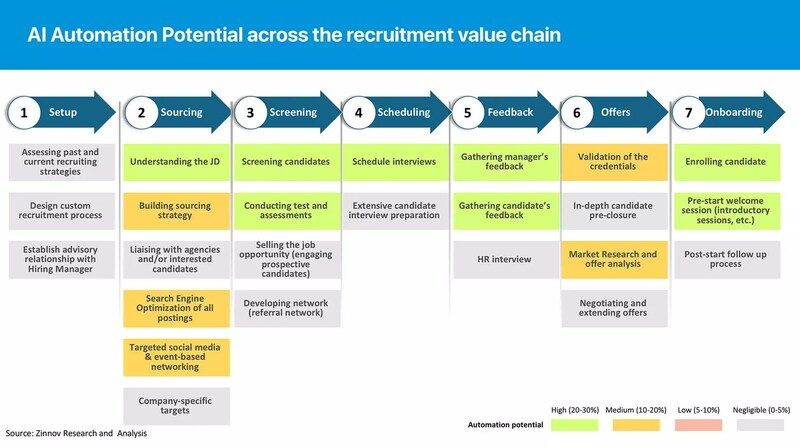 Intrigued and fascinated, we did a rudimentary analysis of the average time spent in a typical recruitment process and their respective automation potential. The results were quite astonishing, and indeed, alarming. There is, indeed, immense potential for AI-based solutions in automating most routine HR tasks. Savings have been calculated on the basis of reported automation projected by industry leaders in the respective segments. We have taken the average of about 100 responses of HR professionals in different industries to compute the allocation time; however, it should be understood that the mean is not always a pinpoint accurate representation, i.e., the time distribution may vary depending on the industry, firm, and the individual. While AI can save efforts in all the processes, sourcing and screening seem to be the most influenced space. We have observed that in a recruitment cycle, large companies are often faced with the problem of plenty. A typical opening at a reputed firm received thousands of resumes, which a recruiter is expected to read and process in a short time. For instance, Glassdoor reported that each corporate job opening attracted 250 resumes, out of which 4-6 would likely be called for an interview, and only one will be offered the job. A typical firm either invests a lot of time in processing this multitude of resumes or adopt ineffective measures. For instance, the six-second thumb rule for screening resumes involves a high possibility of being plagued by manual fatigue and errors. This problem is more than a decade old, and tons of tech-friendly organizations have started taking corrective actions. 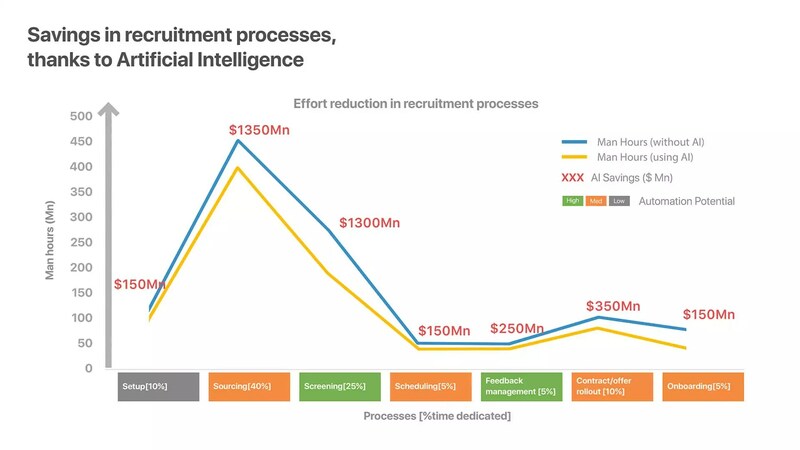 We observed that an AI-based resume screening solution is able to address these pain points, and in fact, is more effective than any other method. Ideal, a Toronto-based start-up, claims to reduce cost per screen by 75% and turnover reduction by 35% through their AI-based recruitment product. The role of HRs has evolved from mere recruitment and transactional service providers (payroll & benefits) to more strategic decisions in the organization. HRs are now collaborating with CEOs, CFOs, CIOs to fuse strategic, financial, and people issues into business strategy. They are increasingly responsible to build and maintain culture, chart talent development, and measure human capital metrics such as employee engagement and productivity. Yamaha, for instance, realized the importance of talent development, and therefore, established a Center of Excellence within the HR function, to focus on organizational effectiveness. AI-based solutions can automate time-consuming processes, allowing HRs to focus more on strategic thinking and execution. Case in point, the automated personal assistants. These assistants can save a tremendous amount of time by automating interview scheduling. X.ai (also known as Amy) is an AI personal assistant that can schedule meetings. Zoom.ai provides an assistant that can schedule meetings, navigate through data repository, answer FAQs, search travel options, etc. While on the one hand, eliminating the human dependency completely out of the equation is a daunting proposition, getting rid of human bias from the equation is of utmost importance, on the other. Even the most rational HR professionals can have certain inherent biases that might reflect in their work. Such biases and stereotypes could potentially influence their recruitment choices, thus resulting in loss of potential talent or hiring unfit ones. One of our clients was worried about inherent and subconscious gender bias in the interview process. While closely examining the recruitment process, we noticed that when women were on interview panels, a female candidate had a lesser probability of getting hired, as the data revealed that women panelists were stricter in rating female candidates compared to male interviewees. After the detailed analysis, the firm made corrective actions to remove this anomaly. Organizations often hire external agencies to address sudden peaks in hiring demands, which is quite frequent in today’s hyper-agile environment. It involves complex interactions with third-party professionals where HRs have to indicate the importance and application of company’s decorum and policies. 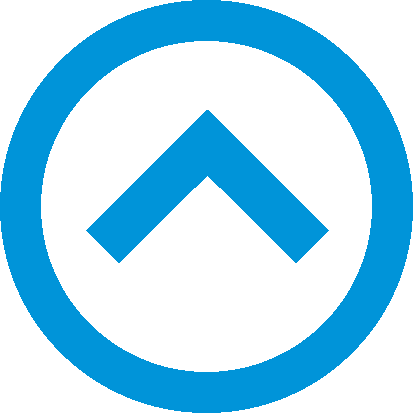 Adoption of automated tools will, in fact, remove the necessity to outsource or hire on-demand recruiting services (ODRS), thus, notching up the productivity level. In an attempt to reduce such inefficiencies in the recruitment processes, Google has developed an automated tool called qDroid, that helps in standardizing interviews by recommending a pre-validated set of questions. We have observed in the past that any technology that enhances business will thrive, irrespective of its surrounding noise, and the same is true of utilizing AI in the HR function. Take, for example, the classic case of the Industrial Revolution. It is strong evidence of how society reacts to technological advancement. It is true that Industrial Revolution brought with it severe repercussions during the early half of the nineteenth century. It disrupted the entire labor market, forced people to opt for different jobs or alter their professions altogether. Despite facing such a massive disruption, our society forged ahead in a progressive manner. A similar major disruption occurred again in 1913 when Henry Ford introduced assembly line technology to manufacture cars. Not only did it reduce the time to build a car by about 79%, but also significantly improved the overall workforce productivity. The modern time is not much different, where innovations in Artificial Intelligence and Machine Learning will automate most of the mundane, repetitive tasks at a scale that will leave us thrilled as well as fearful for the future. This said, employing technology in the HR function is not a new concept. Adoption of technology in HR dates back to the 1980s when PeopleSoft released its first fully integrated client-server HRMS application suite. And by the late 1990s, when it became a hotspot, many firms started delivering cloud-based HCM solutions. It was then joined by breakthrough organizations like SuccessFactors, Saba, Taleo, etc., and later by disruptors like LinkedIn, Workday, HackerRank, and others. Zinnov estimates that the software market for the HR function will continue to grow in the future as well, by ~10-15% per annum, for at least another 4-5 years. Procedures that are robotic, i.e., which involve minimal human intervention can be easily automated. On the other side, processes that require a deep understanding of organizational strategy, human intent, personal behavior, have no/less automation potential. The Million-Dollar Question: How Can HRs Stay Relevant? Slow and inert systems are easy to outpace. Artificial Intelligence has immense potential to disrupt the older and isolated industry verticals, including the HR function. 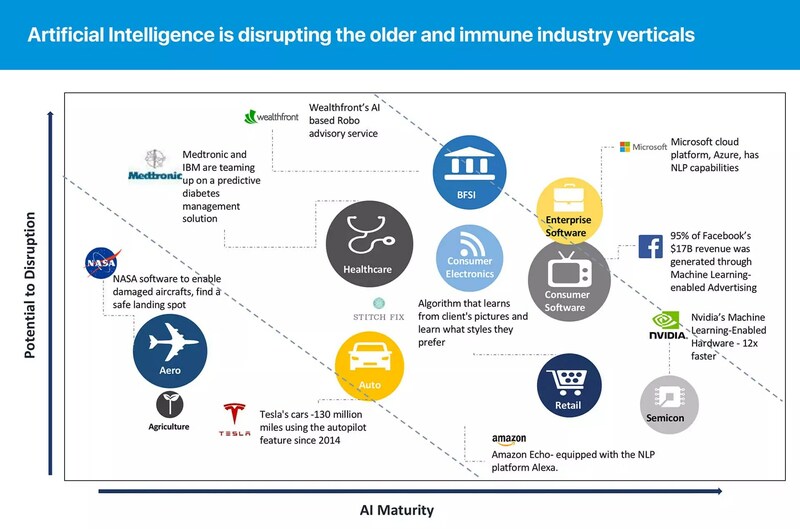 Zinnov’s study of AI maturity across different verticals tells us a similar story, that the traditional sectors are slow in responding to innovation, and will be the ones which will be impacted severely. As can be seen from the research, Aerospace, Healthcare, Automobile, BFSI have a high potential for disruption, but relatively low adoption of AI. This is not an out-of-the-box insight. 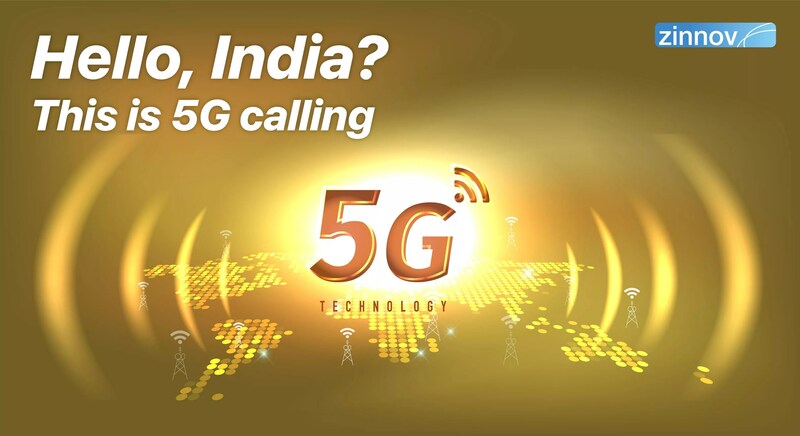 It has been reiterated by thousands of technology leaders and independent researchers, repeatedly, over the years. Mr. Anthony Goldbloom, the founder & CEO of Kaggle (Kaggle is a world-renowned community of data scientists and Machine Learning engineers), in his inspiring TED talk, has precisely pointed out about the future of work. He points out the threatening impact of AI, by stressing on an Oxford research (published in Sept. 2013), which concluded that about 47% of the total US employment is at risk. Through his personal experiences, he warns that a trained machine would easily outperform humans in frequent high-volume tasks like grading school essays, diagnosing eyes, and the like. But this is not the end of the world. There are certain areas where machines are not able to provide effective solutions yet. Areas such as creating a strategic marketing campaign, formulating a business strategy, etc., which are quite intuitive in nature, cannot be automated by machines. Human beings are better adept at understanding complex situations with limited past information than machines. So, the natural course for us to stay relevant is by using our edge over machines, by throwing ourselves out of our comfort zone routinely for continuous learning. We need to focus on developing skills in the sector where we continuously learn and use our human quotient optimally. The same applies to HRs as well. 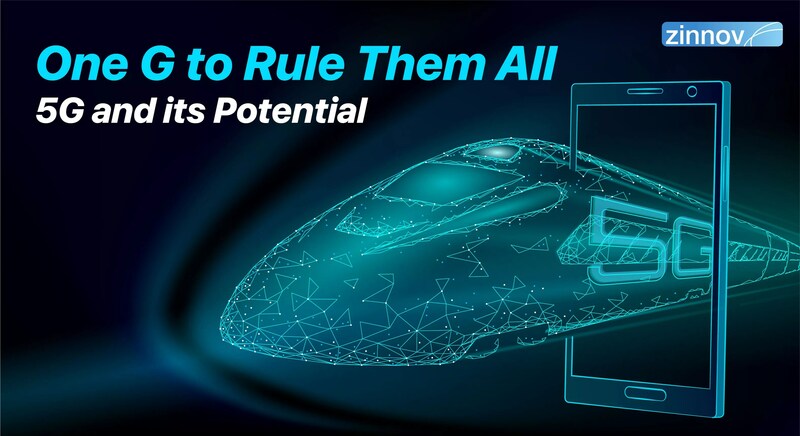 The ones who wish to use AI as their servant and not as a master should develop skills in areas where machines are ineffective and their intuition adds strategic value. 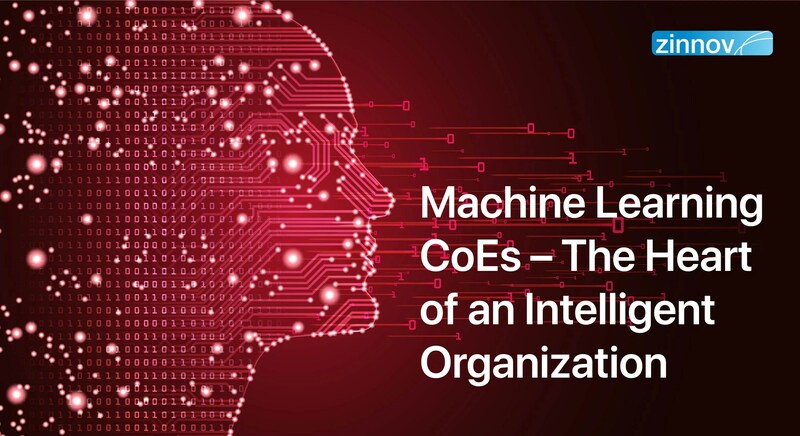 In fact, HRs should leverage AI to impact organizations at a higher level, i.e., improve employee productivity and culture, nurture talent through new modes of learning and development to directly impact on the front line, and thereby increase profits.